We left Arequipa last Wednesday after lots of goodbyes and some panicked last minute packing (our stuff had managed to spread around the entire house over the last month). We had opted for the cheap bus whilst Roy, Suj, Katrina and Will who are also coming to Cusco with us, went for the posher, more expensive option. For once, this actually paid off and our bus turned out not to be that bad - managing to arrive before the others! First impressions of Cusco were mixed. We could tell it was a lovely city but we were missing Arequipa and comparing everything. You get a lot more hassle in Cusco as there´s so many tourists, and we don´t have much time for this anymore. We spent two days in Cusco just hanging out and acclimatising. Our hostel had a garden with hammocks so we spent quite a long time there! We were meant to get picked up to start our Machu Picchu trek at half 7 on Saturday morning. At half 8 the pick-up still hadn´t arrived as they were obviously running on Peruvian time. However, two minutes after we rang up, a lovely Peruvian woman called Nelly arrived and looked after us from there. We had 3 hours on the bus which was OK as the scenery was great, although our guide, Jimmy, insisted on playing some very irritating pan-pipe Andean music. Finally arrived at the top of a very big hill (4000m mountain) and were handed our bikes to ride down it. After a shaky start, our guide Jimmy promptly fell off his bike 2 minutes down the road, the whole group was on our way. There were about 18 of us altogether and out of that many at least half of us fell off our bikes at one point or another during the ride. Becca´s was definately the most impressive fall as she turned round to talk to Laura and drove straight into an irrigation ditch at the side of the road at very high speed. One side of her body now has very little skin left on it, but being the soldier that she is, she got straight back up again and insisted on riding down thr rest of the mountain, after a short "i just have to lie down" episode. Hannah is very proud to announce that against all the odds, she did not fall off her bike, and unsurprisingly, neither did Laura. Needless to say we all had rather sore arses by the end of it but it was definately worth it for the amazing scenery and great fun we had racing down the side of the mountain. We arived at our first hostel that evening in a small village on the edge of the jungle called Santa Maria where we all collapsed onto our beds. It wasn´t the wildest of nights as we had the prospect of a 6am start the next morning so all of us 5 girls were in bed by 9pm! We got a 5 person room between us and was really cool as was like having a girly sleepover with Suji and Katrina - which we haven´t had in a while, although made us miss our friends from home! The next day involved a lot of trekking, and we mean a LOT of trekking. Jimmy had warned us the night before that we were going to start witha3 hour long ´steeped walk´. He was not lying and we were all cursing him after seeing the huge mountain that we were to climb. After 4 hours of trekking, we had a very welcome stop at teh top of the first mountain (yes there was more than one) at an old man´s house who claimed to be 98 years old and to have put up Che Guevara when he was escaping from Argentina. He also gave us some 100% cocoa chocolate which was the most disgusting thing we have ever tasted - enough to put even us 3 off chocolate! And had some sort of crazy animal whose party trick was to drink from a sports bottle whilst stood up on his hind legs. This place also had soem fantastically placed hammocks wich we all collapsed into and didn´t move from for quite soem time, as well as some tiny kittens who Becca fell in love with. Needless to say we were quite gutted to leave this place and continue our path up the mountain. We were rewarded at the end of the day after 10 hours of walking, when we arrived at the thermal baths. These were placed in the valley amid beautiful mountains against the river and were just what we needed to sooth our aching muscles. We got given the choice of staying in the baths for 45 minutes and walking for 2 hours up another mountain, or staying for 2 hours and getting a local bus to our hosel. Guess which one we chose?! We spent a very enjoyable 2 hours in the baths just bobbing around and loving the fact that we weren´t walking anymore, before getting a local bus (pretty scary experience) into the nearest town - Santa Teresa. This was a slightly bigger town than last ight and was even home to a discoteca, which announced its presence by having a huge light-up cocktail glass on it´s roof! Jimmy was very keen on getting us to the discoteca, so despite the fast that we were struggling to move, let alone dance, we all went along to check it out. This turned out to be surprisingly happening and we stayed out till nearly midnight (crazy times). The third day of our trek started with a three hour walk along the railway lines until we got to Aguas Calientes which is the town nearest Machu Picchu. Arrived at our rather swanky hostel and were given a measly half hour to recover, before being marched to the ironically named ´Big happy mountain´. Big it definately was, happy were not sure about! This was climbed by a series of 7 ladders, each one about 30m long, which were then followed by about a million very steep steps to the top. We were already aching before we started this climb but by teh time we reached the top we were in serious pain and a lot of moaning was done on the way up! At one point the only thing that kept us going was that there were two portugese lads that were the only people left behind us from our group leading to frequent shouts from Suj of ´Quick, the portugese are coming!´which prompted a quickening of our pace. When we did get to the top though, there were stunning views accross the valley to Machu Picchu and even we had to admit that it was worth it. After lots of photos, we started the descent which was even more scary than the way up, as a result of the treacherous drops on either side of the path - we nearly lost Suj to one of them when she put her foot in the wrong place and dissappeared from sight momentarily. Back at our hostel at last, we had one of the most welcome showers that any of us had ever had, then went out for a just as welcome meal. That night we also experienced the most crazy thunder storm ever - we were very pleased to be inside at the time and sat watching out the window as all the surrounding mountains were lit by in the lightening and the hostel was pelted with hail stones. 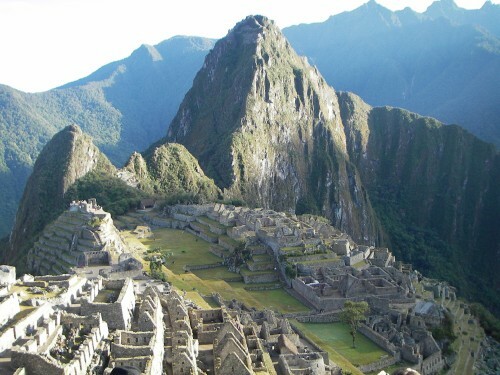 We were slightly worried however as we were due to trek up to Machu Picchu at 4am the next morning. Luckily this had cleared up, although it still wasn´t exactly enjoyable to get up at half 3 to start climbing upamountain by torch light. We beat all the tour groups up though and the sunrise over machu picchu was definately one of the most amazing exeriences of the whole trip (top 3 we would say). Machu Picchu was bigged up so much that we were worried that we wuold be disappointed, however it definately lived up to all the hype. We ran straight to the queue to get our tickets to climb Huana Picchu - the big mountain that overlooks the ruins (they only let 400 people climb it everyday). However, when it came to it, we decided our legs couldnt physically take us up, so we found a nice spot in the sun which overlooked the ruins to relax and take in the views instead. Jimmy gave us a tour and enlightened us on the history, which was really interesting. We learnt that it took 70 years to build, but was in fact not as old as Durham Cathedral - something which Becca especially found extremely interesting! We don´t know what it was that made it so special but something about it´s location and the fact that you could actually imagine people living here, made it a magical experience (we know that sounds really cheesy but it´s actually true!) We would reccommend anybody to do it (there was a 90 year old woman in a wheelchair being carried around by her family so no-one has any excuses not to do it! )Even though the trek was bloody hard work (possibly the hardest thign we´ve ever done) it was definately worth it as the people arriving on their tour buses didn´t look like they had the same sense of achievement as we did. We were so lucky to have a really great group that kept each other going or else we´re not sure any of us would have made it! By the time we got back to Aguas Calientes, our legs were literally shaking from exhaustion and we were pleased to get on the train back towards Cusco. Obviously things never go according to plan and when we arrived at the train station from where we were supposed to be catching our bus, there was in fact no bus to catch. As well as this Becca managed to leave a bag of clothes on the train behind them. Losing clothes is somethign she never takes very well (especially Topshop ones!) although she could get some replacements from Peru´s slightly less classy equivalent - Topitop. Nelly, our assistant tour guide, bless her, got straight to work and ran around like a headless chicken until she found a bus for us to catch back to Cusco. 3 hours later and after 2 different bus journeys (one fo which had 16 people squashed into a tiny 12 person minibus, with a random local woman sat on one of the lads knees) we arrived in Cusco. One last meal with everyone, then we were all shattered so had to admit defeat and go to bed early once again. We also had to say a very sad goodbye to Suji and Roy who were returning back to Arequipa early the next morning. One of the hardest goodbyes we´ve had to say. The next day we just walked around, whilst complaining about how much our muscles were aching, did a spot of shopping ad booked our bus tickets to Lima, where we had to pass through to get to Mancora. Hannah had one last meal with her dad and Alison, then had to say goodbye to them too, as they were leaving to trek in Bolivia. Something that didn´t sound to appealing to us after the last 4 days! We then had a meal and a night out in Cusco with the remainder of our group from Machu Picchu. This was a great night - Cusco nightclubs play some really good salsa music and despite our aching muscles we still managed to dance! The next day was our last one with Will and Katrina, and there were soem very tearful goodbyes to be had. It really is just the three of us again from now on, which it hasn´t been for a long time. True to our style, we didn´t really leave too much time to catch the bus, which resulted inavery desperate dash. Several Peruvians were nearly knocked over in our haste to get to the bus stand. Well it´s not our fault they´re so short!As always though, we made it just in the knick of time and we were soon sat on our 24 hour bus to Lima. Whe we did finally make it, we decided to get the hell out of there as soon as possible. It´s really not a very attractice city and we didn´t feel safe which is one thing we really hate. We were reminded of Delhi as we marched through the streets with our day bags clutched to our fronts. Had a meal and then jumped on the next night bus to Trujillo, where we are now. We´re just having a day here to break up the journey. We don´t mind though as it´s quite a nice city and has a cinema so hopefully we´re going to catch the new Harry Potter film - the prospect of which Hannah and Becca are very excited about! Next stop for us is Mancora i.e. THE BEACH for our last week of sunning ourselves before heading home. We´re hoping it´s actually going to be sunny or else we won´t be happy chappies. We´ll let you know how we get on. See you in 11 days!!!! Arghhh!! !